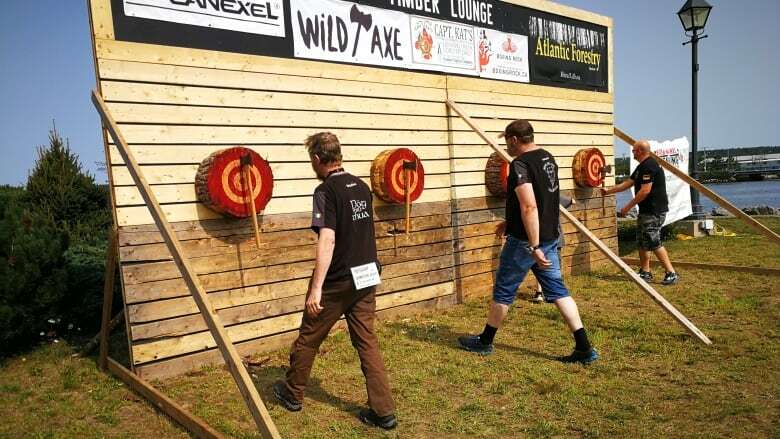 The Canadian National Axe Throwing Championships has drawn close to 60 competitors from across the country and around the world. 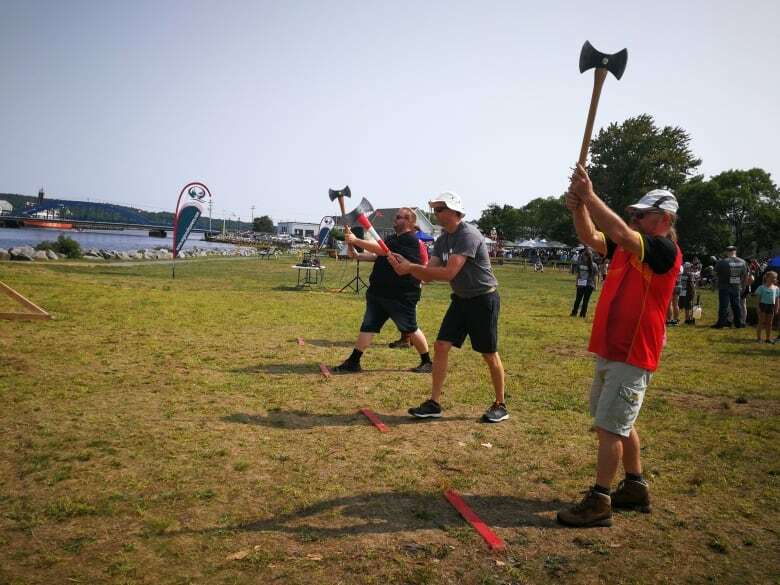 Axe throwers from across Canada and even some from as far away as Europe are at Centennial Park on the Mersey River in Liverpool, N.S., this weekend to take part in the Canadian National Axe Throwing Championship. Close to 60 competitors have signed up for the championship, which has categories for men, women and youth. There is also $11,000 in prizes. "Most of our international friends who traveled here, this is the first time they've ever been to Canada. 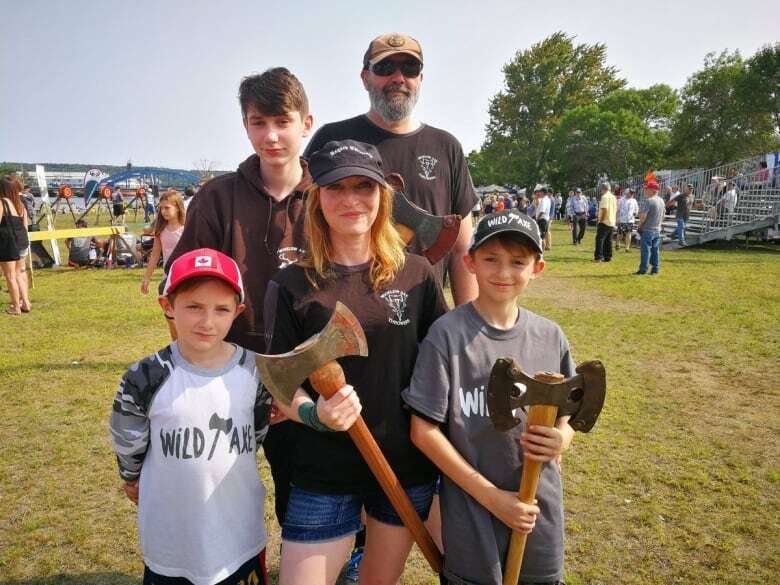 They came specifically for this event," said Ryan MacIntyre, president and founder of the North Nova Lumberjacks Society and co-organizer the event. "It means so much they would choose to do that and take a risk on coming here." In addition to the Canadians, there are 13 competitors from Europe, including the reigning world champion Daniel Hedberg of Sweden. "It's a big axe family, I'm always happy to see new people throwing," Hedberg said. MacIntyre said hosting the national championship connects Nova Scotia to the world stage. "It brings the international competitors here and that allows them to see what we can offer and hopefully one day we can bring the world championships here," he said. Oonagh McMorrow and her husband Leigh Standing and their children Finn, Oscar and Ben travelled from Ireland for the competition. "We met up with some of the organizers at competitions last year in Europe and they invited us over to take part," McMorrow said. She said her husband initially introduced her to axe throwing after he was invited to join a club nearly two years ago. "He came home absolutely hooked and he used to just talk about what a buzz he got out of it and how much fun it was," said McMorrow who lives in Wicklow County. Finn Standing said it "means a lot" to his family to be able to travel and compete together. The trip to Canada marks the first time they have travelled overseas together. "We all love the sport, it's a really fun. We have a load of friends over here and it's nice to come and see them," he said. McMorrow said the family has enjoyed their time in Nova Scotia so far and would likely come back again together. "We absolutely love it and we'll definitely be back here," McMorrow said.